This topic contains 150 replies, has 12 voices, and was last updated by Darkest Star Games 1 week, 5 days ago. 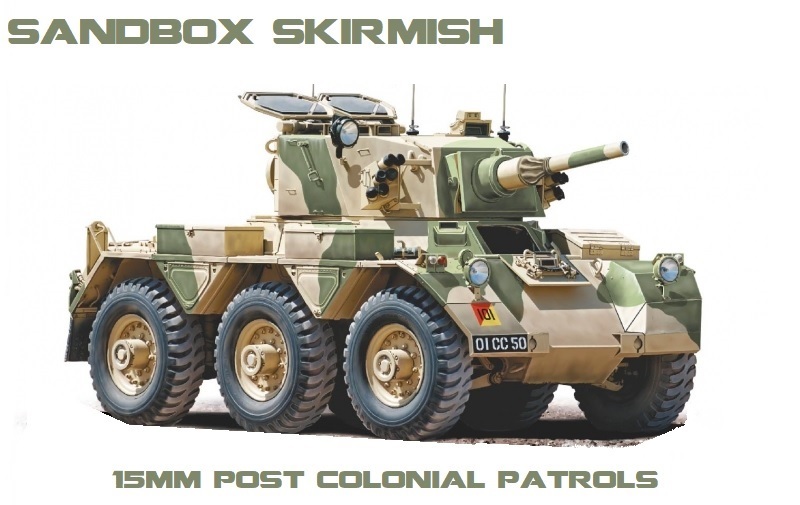 I’ve started a new Winter project this weekend, a 15mm post-colonial / cold war skirmish project, based around a terrain building theme but also involving some platoon level forces using Peter Pig figures. I’ve been meaning to do this for ages but got a boot up the bum from a prototype desert board that I boshed together from a cork pin board and some cheap end of line emulsion paint. This looked OK so I dug out the figures, scenic bits and laser cut building kits to kick things off and expand the terrain making idea. Despite the photo, the initial focus will be on a 1960’s era British platoon, based on an imaginations re-interpretation of the campaign in Aden. Later on I’m planning to diversify this to include similar sized forces for the French and a generic ‘peacekeeping’ force using the PP Israeli figures, along with some rebels / freedom fighters both in regular and irregular units. The theme is definitely not modern but more post-colonial, retreat from Empire. This topic was modified 5 months, 3 weeks ago by Jim Jackaman. Sounds quite excellent, looking forwards to what you knock out. Oh, I like it! I too will be watching for your progress! I like the blog comment about the number of projects you have going on, some abandoned, some incomplete…I am the same way! I’m on to the buildings next. I have a dozen or so of the Blotz and Red Vectors Middle Eastern laser cut houses to assemble…shares in PVA glue companies will be on the up! 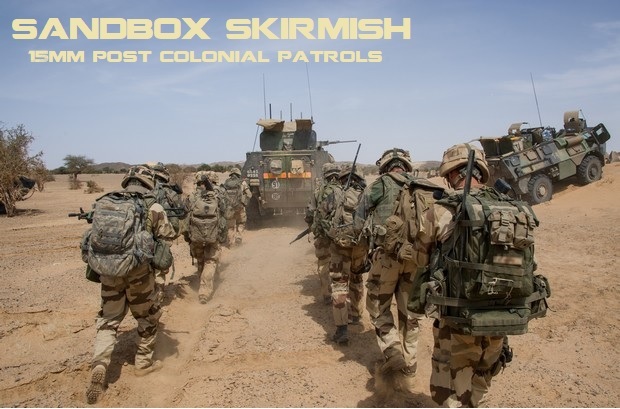 I’ve also decided to go big and run this as a platoon level solo campaign, primarily so I can use No End in Sight, which I’ve always thought would be perfect for this project. This reply was modified 5 months, 3 weeks ago by Jim Jackaman. I have a dozen or so of the Blotz and Red Vectors Middle Eastern laser cut houses to assemble…shares in PVA glue companies will be on the up! I’m liking the look of some of the scatter bits – pots, jars etc, and the well. 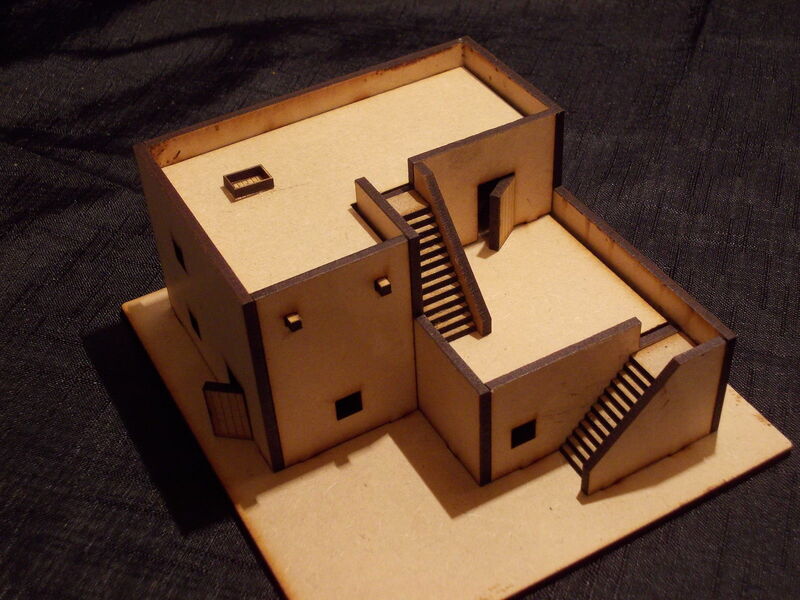 Just put together some laser cut Middle Eastern style buildings from Blotz and Red Vectors for the Skirmish Sandbox project. They need to be filled, textured, sanded and painted before I add the doors, hatches and details, but I’m making good progress so far! I have a few more of these to build including some compounds before I can get on to the clutter, trees, rocky outcrops and so on. I want to turn this into some sort of fortified FOB for my British infantry platoon to occupy and patrol from. Apart from some sandbags (which I need to find) and a look out post on top, what do you think I need to add? I was thinking of adding a perimeter wall around the outside for a start, with a big metal sliding gate? I’d also block off some of the lower windows and doorways, or at least add some bars etc. This reply was modified 5 months, 2 weeks ago by Jim Jackaman. You’ve got to have some sandbags, can’t live without those. Sounds like a really interesting project – and true to your normal work ethic, within apparently moments of thinking about it, you’ve already got all those buildings done ! I dunno how you find the time – would have taken me months…..
thinking about things to add to the building – I would vote for corrugated iron panelling, oil drums, Compo ration and ammo boxes (all could be utilised in the fortifications) and barbed wire – some sort of comms antenna might be an idea, too, alongside that flagpole….. had the BATT house at the battle of Mirbat in mind…. This reply was modified 5 months, 3 weeks ago by Steelonsand. I’ve actually got ‘Sandbox’ myself. I haven’t played it yet, despite it’s similarity to 5Core, just haven’t had time. I actually created Task Force Dusty (in South Leon, on my Cuba Libre blog) just for this, but then other projects popped up and I ended up changing the trajectory of the South Leon campaign, so haven’t gotten to it, but I will. Perhaps you’re project will spur mine on! Good ideas…really liking the sandbag and ammo box walls. I will also add a radio mast to be shot off at an inconvenient moment. I was also thinking of adding a mortar in a sandbag position on the roof…might be handy? As has been mentioned, can’t go wrong with corrugated iron on any of the buildings. And for when the antennae gets shot down, how about SOS rockets? I’ve been working on the patrol base / OP for the British infantry platoon. It’s not finished but it’s about half way there in terms of construction if not paintwork. Any suggestions for clutter? This is looking good. I wish I had the space for 15mm. Just finished a desert terrain board for this project, using an old picture that I found in the local charity shop, some acrylic paste, some old emulsion paint and a few half used tester pots (total cost about £12). Looking very good! Don’t forget old oildrums filled with sand, they used those quite a bit at the BATT house and in the various outposts during the snit in Oman. It warped a bit in the re-painting but hopefully will un-bend once it dries out a bit. If not, I’ll have to scratch build some rocky hills instead of taking a shortcut by re-painting these resin ones. I hadn’t thought of oil drums but it makes a lot of sense. I think I have some crappy resin ones somewhere and some really nice ones from The Scene as well. Time to go for another rummage! Now where did I put my lead snorkel? Dug out the other resin hills and realised that they’d been stored away for so long that they had warped anyway, so nothing to do with repainting with emulsion. I have two more to paint now, so will crack on. Any ideas how to flatten them out? Actually, I did use by bag of tools to try to squash it a bit, so you’re not far off. Thanks for the link…good stuff! BTW, your board looks fantastic! The warping actually isn’t that bad and I can live with it as long as they don’t get any more bendy. I’ve added a couple more resin re-painted hills so that I can make a wadi type feature for the patrols to negotiate and the rebels to use for an ambush. I only re-painted another two of these Battlefield in a Box hills, even though I have a fourth one spare, as on a 32” square terrain board they fill up a most of the available space. I will probably make some more small rocky outcrops and scrub to scatter about as well, so that there’s some lower level cover for the RPG teams to hide in too. I also tried out the board with my 20mm Mexican Revolution terrain pieces, to see if they matched up and I could use the board for that project too. I think it’s not a bad fit, so will be able to re-light the fire under my Fistful of Lead: Viva la Revolucion! project as well….too many things to do, not enough time! Ever the comedian Colin! Actually, I did use by bag of tools to try to squash it a bit, so you’re not far off. Thanks for the link…good stuff! The rebels have upped their game and now have Camels! Oh yes. Very cool stuff! Hmmm… mount a recoilless rifle on a camel, or maybe even the rocket pod from a downed helo…. yessss, this pleases me. Any ideas how to flatten them (resin hills) out? Perhaps not flatten them out but turn them over and use plastic wood, or some other self hardening putty, to build (fill) the bottom out straight. Good idea…that might work well. Thanks. It needs to be textured, painted and detailed but I think it’s not too bad for an hour or so’s work this morning. I will probably add fillers to the bottom of the base so that it actually blends in and locks into place, without the nasty gap. This reply was modified 5 months, 1 week ago by Jim Jackaman. Now with some texturing using acrylic paste (I couldn’t be bothered to scribe any stone work so it’s a tasteful pebble dash instead). The GZG sci-fi figure is just there for scale but I have been thinking of other uses for this terrain including the NW Frontier in the 1930’s and the for The Men Who Would be Kings in 15mm in the Sudan. 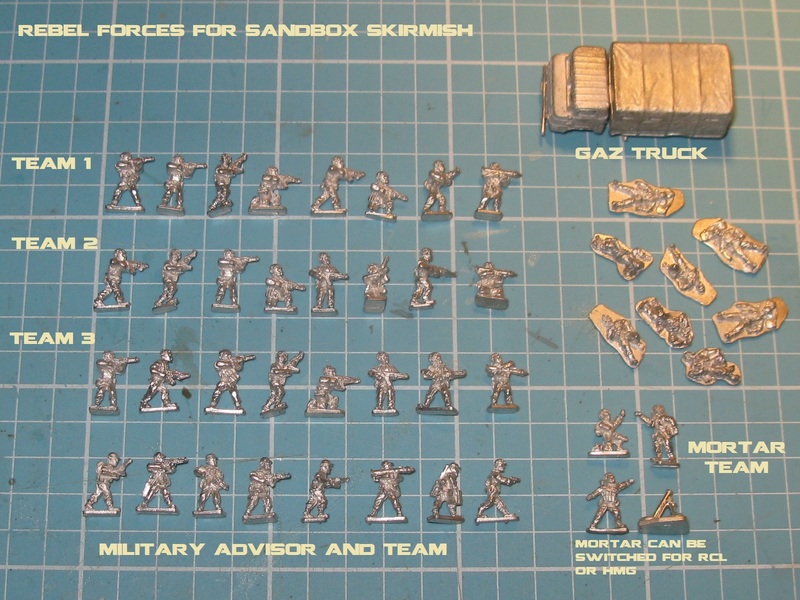 I’ve cleaned up and undercoated the British Infantry platoon including some new figures that I’ve converted by doing some simple head swaps (engineer mine detector / Vickers MMG / dog handler). I should be able to start painting these tomorrow, if I don’t get tasked with ‘things to do’ by SWMBO.